from man to woman, youngster to suckling, ox to sheep, camel to donkey. So he gathered an army, and killed out Amalek, except for some animals and the king, Agag. Why didn't he kill Agag? No one knows for sure since no reason is given in the text (the T'anach/the Bible). Therefore the question is open to conjecture within the commentaries and midrashim. @msh210 gives an answer from the commentaries of Rabbi Moshe Alshich. Another answer: it was "professional courtesy" -- while Saul was willing to kill the people, he decided to spare his kingly equivalent, Agag. He also decided to spare the animals for later use as sacrifices. (But spoils were not allowed from this battle.) Both decisions were examples of Saul's lack of commitment to follow Gd's specific requests. According to 1 Samuel 10:8, Samuel had told Saul to wait for seven days after which they would meet; Samuel giving Saul further instructions. But as Samuel did not arrive after 7 days (1 Samuel 13:8) and with the Israelites growing restless, Saul started preparing for battle by offering sacrifices. Samuel arrived just as Saul finished offering his sacrifices and reprimanded Saul for not obeying his instructions. He didn't follow Gd's instructions closely enough--and when he deviated from his instructions, his decisions weren't good. As a result, the CEO replaced him. Added: What's my source? The idea of "professional courtesy" was from a shiur by one of my teachers at Pardes, in Jerusalem. Either R. Landes or R. Schweiger, as I recall. I added the additional content. When it comes to explaining unanswered questions from the T'nach text, I don't find the apologetic stance of some commentaries particularly helpful. Eg, R. Alshich explaining how Saul could have thought he was doing Gd's will. I think the figures of our Bible were real humans and, on occasion, had the too-real failings of humans. To me, that makes them more real and more approachable. On the other hand, I accept that there are many who feel that the Biblical figures were perfect, by definition, and that they could not therefore make any mistakes. I think the imperfections of the Biblical figures often provides the greatest learning opportunities. David is a good example of a great, but not perfect, Biblical figure. He was an excellent leader for the people. But he was also flawed. Eg see Bathsheba and Uriah the Hittite. I particularly enjoy his realpolitik instructions to King Solomon which included (I paraphrase) "(I didn't kill Joab after what he did.) Please make sure that he does not die of old age (please kill him for me)." 1 Kings 2:5. 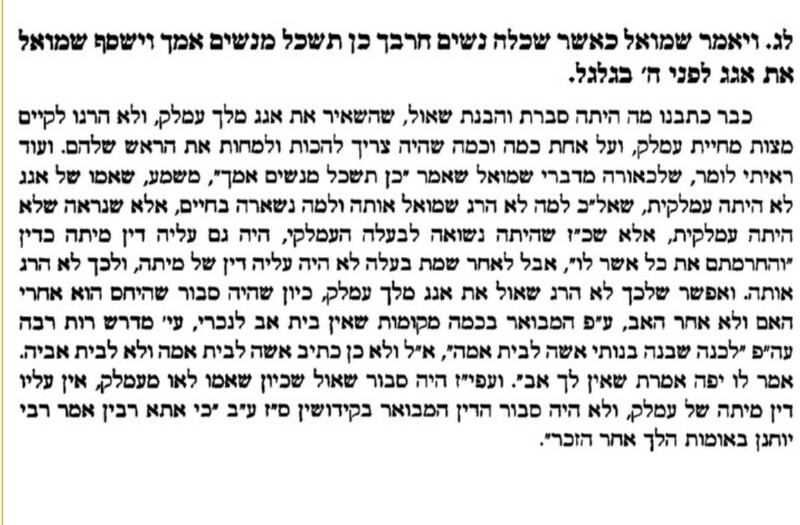 The Mishbtzos Zahav posits that Shaul may have made the mistake that non Jews follow lineage maternially(see Kidushin 67b). If one looks closely at the passuk ,Shmuel says to Agag that he is going to make his mother childless just like he did. From this one can learn that Agag' s mother was still alive since she was not from Amalek. However, Shaul mistake was that Agag is not really an amalaki,since his mother wasnt one. Not the answer you're looking for? Browse other questions tagged army-military-war samuel-shmuel-book-of amalek king-saul .